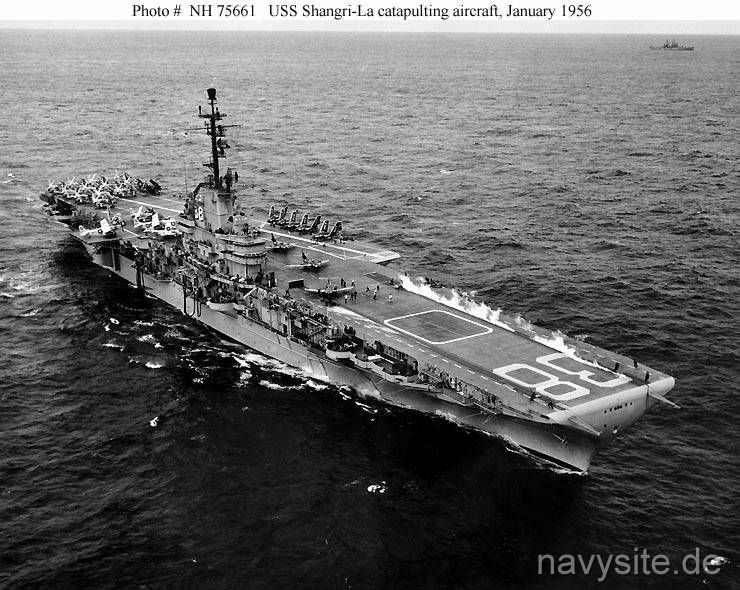 USS SHANGRI-LA was one of the ESSEX - class aircraft carriers and the first ship to bear the name. The name "SHANGRI-LA" was taken from a speech of President Roosevelt regarding the Doolittle Raid - the first American air strike against the Japanese homeland - in 1942. In his speech, President Roosevelt referred to the origin of the Tokyo raid only as "SHANGRI-LA". Reclassified as attack aircraft carrier CVA 38 on October 1, 1952, and antisubmarine warfare aircraft carrier CVS 38 on June 30, 1969, the SHANGRI-LA was decommissioned on July 30, 1971, and subsequently placed in the Atlantic Reserve Fleet berthed at Philadelphia. SHANGRI-LA remained there for the next 11 years, and was stricken from the Navy list on July 15, 1982. On August 9, 1988, she was disposed of by the Marine Administration. Builder: Norfolk Naval Shipyard, Norfolk, Va. This section contains the names of sailors who served aboard USS SHANGRI-LA. It is no official listing but contains the names of sailors who submitted their information. 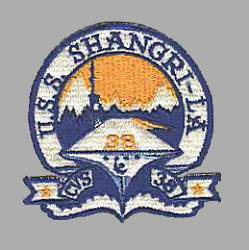 Click here to see which USS SHANGRI-LA memorabilia are currently for sale on ebay. April 7, 1960 off Valparaiso, Chile USS SHANGRI-LA suffers an explosion of an air separator operated by a gasoline motor while, injuring three. August 27, 1965 off Sardinia, Italy USS SHANGRI-LA and USS NEWMAN K. PERRY (DD 883) collide off Sardinia, killing one sailor and injuring another on the destroyer. The PERRY's bow is crushed and twisted to starboard. Both ships are repaired at Naples and return to duty with the Sixth Fleet. Below is a report about the collision from SHANGRI-LA's 1965 cruise book. January 10, 1970 off Jacksonville, Fla. USS SHANGRI-LA suffers a fire during training when an A-4 Skyhawk aircraft parked on the flight deck ignites, killing one. USS SHANGRI-LA was laid down by the Norfolk Navy Yard, at Portsmouth, Va., on 15 January 1943, launched on 24 February 1944, sponsored by Mrs. James H. Doolittle, and commissioned on 15 September 1944, Capt. James D. Barner in command. SHANGRI-LA completed fitting out at Norfolk and took her shakedown cruise to Trinidad, B.W.I., between 15 September and 21 December 1944, at which time she returned to Norfolk. On 17 January 1945, she stood out of Hampton Roads, formed up with the large cruiser USS GUAM (CB 2) and USS HARRY E. HUBBARD (DD 748), and sailed for Panama. The three ships arrived at Cristobal, C.Z., on the 23rd and transited the canal on the 24th. SHANGRI-LA departed from Balboa, C.Z., on 25 January and arrived at San Diego, Calif., on 4 February. There she loaded passengers, stores, and extra planes for transit to Hawaii and got underway on 7 February. Upon her arrival at Pearl Harbor on 15 February, she commenced two months of duty, qualifying land-based Navy pilots in carrier landings. On 10 April 1945, she weighed anchor for Ulithi Atoll where she arrived ten days later. After an overnight stay in the lagoon, SHANGRI-LA departed Ulithi in company with USS HAGGARD (DD 555) and USS STEMBEL (DD 644) to report for duty with Vice Adm. Marc A. Mitscher's Fast Carrier Task Force. On 24 April, she joined Task Group 58.4 while it was conducting a fueling rendezvous with TG 50.8. The next day, SHANGRI-LA and her air group, CVG-85, launched their first strike against the Japanese. The target was Okino Daito Jima, a group of islands several hundred miles to the southeast of Okinawa. Her planes successfully destroyed radar and radio installations there and, upon their recovery, the task group sailed for Okinawa. SHANGRI-LA supplied combat air patrols for the task group and close air support for the 10th Army on Okinawa before returning to Ulithi on 14 May. 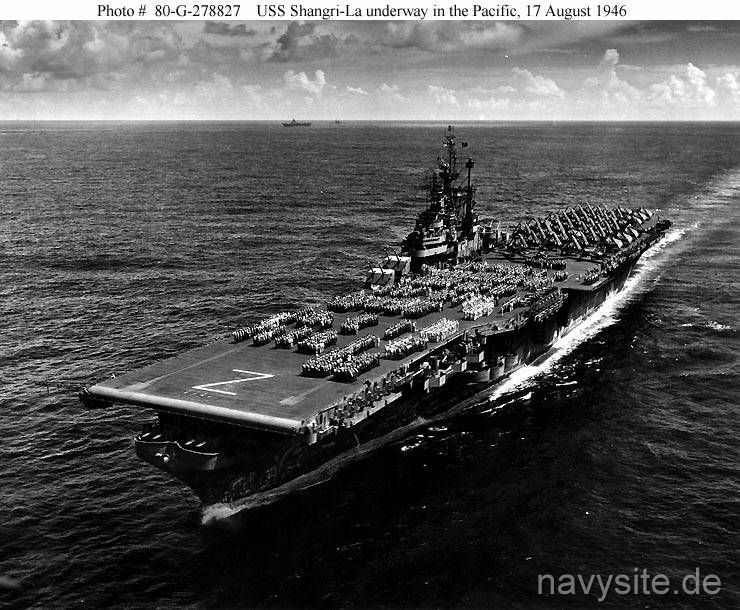 While at Ulithi, SHANGRI-LA became the flagship of the 2nd Carrier Task Force. Vice Adm. John S McCain hoisted his flag in SHANGRI-LA on 18 May 1945. Six days later, TG 58.4, with SHANGRI-LA in company, sortied from the lagoon. On 28 May, TG 58.4 became TG 38.4 and Vice Adm. McCain relieved Vice Adm. Mitscher as Commander, Task Force 38, retaining SHANGRI-LA as his flagship. On 2 and 3 June, the task force launched air strikes on the Japanese home islands - aimed particularly at Kyushu, the southernmost of the major islands. Facing the stiffest airborne resistance to date, SHANGRI-LA's airmen suffered their heaviest casualties. On 4 and 5 June, she moved off to the northwest to avoid a typhoon; then, on the 6th, her planes returned to close air support duty over Okinawa. On the 8th, her air group hit Kyushu again, and, on the following day, they came back to Okinawa. On 10 June 1945, the task force cleared Okinawa for Leyte, conducting drills en route. SHANGRI-LA entered Leyte Gulf and anchored in San Pedro Bay on 13 June. She remained at anchor there for the rest of June, engaged in upkeep and recreation. On 1 July, SHANGRI-LA got underway from Leyte to return to the combat zone. On 2 July, the oath of office of Assistant Secretary of the Navy for Air was administered to John L. Sullivan on board SHANGRI-LA, the first ceremony of its type ever undertaken in a combat zone. Eight days later, her air group commenced a series of air strikes against Japan which lasted until the capitulation on 15 August. SHANGRI-LA's planes ranged the length of the island chain during these raids. On 10 July, they attacked Tokyo, the first raid there since the strikes of the previous February. On 14 and 15 July, they pounded Honshu and Hokkaido and, on the 18th, returned to Tokyo, also bombing battleship NAGATO, moored close to shore at Yokosuka. From 20 to 22 July, SHANGRI-LA joined the logistics group for fuel, replacement aircraft, and mail. By the 24th, her pilots were attacking shipping in the vicinity of Kure. They returned the next day for a repeat performance, before departing for a two-day replenishment period on the 26th and 27th. On the following day, SHANGRI-LA's aircraft damaged cruiser OYODA, and battleship HARUNA, the latter so badly that she beached and flooded. She later had to be abandoned. They pummeled Tokyo again on 30 July, then cleared the area to replenish on 31 July and 1 August. SHANGRI-LA spent the next four days in the retirement area waiting for a typhoon to pass. On 9 August, after heavy fog had caused the cancellation of the previous day's missions, the carrier sent her planes aloft to bomb Honshu and Hokkaido once again. The next day, they raided Tokyo and central Honshu, then retired from the area for logistics. She evaded another typhoon on 11 and 12 August, then hit Tokyo again on the 13th. After replenishing on the 14th, she sent planes to strike the airfields around Tokyo on the morning of 15 August 1945. Soon thereafter, Japan's capitulation was announced; and the fleet was ordered to cease hostilities. SHANGRI-LA steamed around in the strike area from 15 to 23 August, patrolling the Honshu area on the latter date. Between 23 August and 16 September, her planes sortied on missions of mercy, air-dropping supplies to Allied prisoners of war in Japan. SHANGRI-LA entered Tokyo Bay on 16 September, almost two weeks after the surrender ceremony on board USS MISSOURI (BB 63), and remained there until 1 October. Departing Japan, she arrived at Okinawa on 4 October stayed until the 6th, and then headed for the United States in company with Task Unit 38.1.1. She sailed into San Pedro Bay, Calif., on 21 October and stayed at Long Beach for three weeks. On 5 November, she shifted to San Diego, departing that port a month later for Bremerton, Wash. She entered Puget Sound on 9 December, underwent availability until the 30th, and then returned to San Diego. Upon her return, SHANGRI-LA began normal operations out of San Diego, primarily engaged in pilot carrier landing qualifications. In May 1946, she sailed for the Central Pacific to participate in Operation Crossroads, the atomic bomb tests conducted at Bikini Atoll. Following this, she made a brief training cruise to Pearl Harbor, then wintered at Puget Sound Naval Shipyard. In March 1947, she deployed again, calling at Pearl Harbor and Sydney, Australia. When she returned to the United States, SHANGRI-LA was decommissioned and placed in the Reserve Fleet at San Francisco on 7 November 1947. SHANGRI-LA recommissioned on 10 May 1951, Capt. Francis L. Busey in command. For the next year, she conducted training and readiness operations out of Boston, Mass. Reclassified an attack aircraft carrier, CVA 38, in 1952, she returned to Puget Sound that fall and decommissioned again on 14 November, this time for modernization at Puget Sound Naval Shipyard. During the next two years, she received an angled flight deck, twin steam catapults, and her aircraft elevators and arresting gear were overhauled. At a cost of approximately $7 million, she was virtually a new ship when she commissioned for the third time on 10 January 1955, Capt. Roscoe L. Newman commanding. She conducted intensive fleet training for the remainder of 1955, then deployed to the Far East on 5 January 1956. On 2 September 1956, the second day of the National Air Show, Lt. (j.g.) R. Carson, flying an F3H-2N Demon of VF-124, captured the McDonnell Trophy with a non-stop, non-refueling flight from SHANGRI-LA off the coast of San Francisco to Oklahoma City. Lt.(j.g.) Carson covered the 1,436 miles in two hours 32 minutes 13.45 seconds for an average speed of 566.007 mph. On 16 March 1960, she put to sea from San Diego en route to her new home port, Mayport, Fla. She entered Mayport after visits to Callao, Peru; Valparaiso, Chile; Port of Spain, Trinidad; Bayonne, N.J.; and Norfolk, Va.
After six weeks of underway training in the local operating area around Guantanamo Bay, Cuba, she embarked upon her first Atlantic deployment, a NATO exercise followed by liberty in Southampton, England. Almost immediately after her return to Mayport, SHANGRI-LA was ordered back to sea, this time to the Caribbean in response to trouble in Guatemala and Nicaragua. She returned to Mayport on 25 November 1960 and remained in port for more than two months. Between 1961 and 1970, SHANGRI-LA alternated between deployments to the Mediterranean and operations in the western Atlantic, out of Mayport. 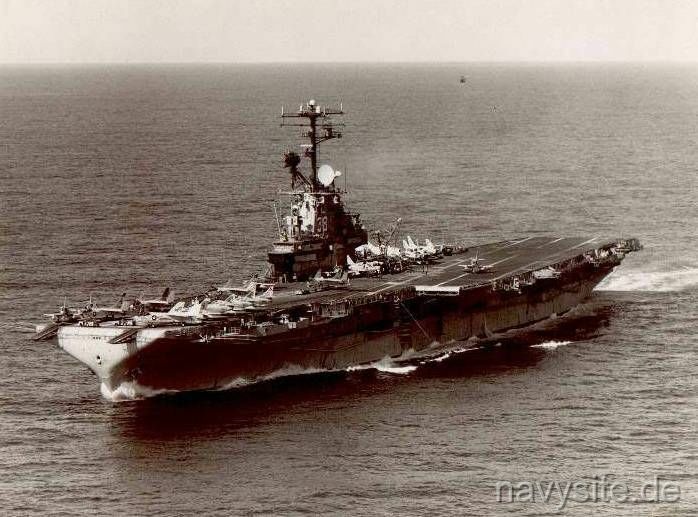 She sailed east for her first tour of duty with the 6th Fleet on 2 February 1961. On 1 June 1961, SHANGRI-LA, along with USS INTREPID (CV 11) and USS RANDOLPH (CV 15), was ordered to stand by off southern Hispaniola when a general uprising seemed about to follow the assasination of President Trujillo of the Domincan Republic. She returned to the United States that fall and entered the New York Naval Shipyard. Back in Mayport by the beginning of 1962, SHANGRI-LA stood out again for the Mediterranean on 7 February 1962. After about six months of cruising with the 6th Fleet, she departed the Mediterranean in mid-August and arrived in Mayport on the 28th. Following a month's stay at her home port, the aircraft carrier headed for New York and a major overhaul. SHANGRI-LA was modified extensively during her stay in the yard. Four of her 5-inch mounts were removed, but she received a new air search and height finding radar and a new arrester system. In addition, much of her electrical and engineering equipment was renovated. After sea trials and visits to Bayonne, N.J., and Norfolk, Va., SHANGRI-LA returned to Mayport for a week in late March 1963; then put to sea for operations in the Caribbean. Eight months of similar duty followed before SHANGRI-LA weighed anchor for another deployment. On 1 October 1963, she headed back to the 6th Fleet for a seven-month tour. SHANGRI-LA continued her 2nd and 6th Fleet assignments for the next six years. During the winter of 1964 and the spring of 1965, she underwent another extensive overhaul, this time at Philadelphia, then resumed operations as before. On 30 June 1969, she was redesignated an anti-submarine warfare aircraft carrier CVS 38. In 1970, SHANGRI-LA returned to the western Pacific after an absence of ten years. She got underway from Mayport on 5 March, stopped at Rio de Janeiro, Brazil, from the 13th to the 16th, and headed east through the Atlantic and Indian oceans. She arrived in Subic Bay, R.P., on 4 April and, during the next seven months, launched combat sorties from Yankee station. Her tours of duty on Yankee station were punctuated by frequent logistics trips to Subic Bay, by visits to Manila, R.P., and Hong Kong, B.C.C., in October, and by 12 days in drydock at Yokosuka, Japan, in July. 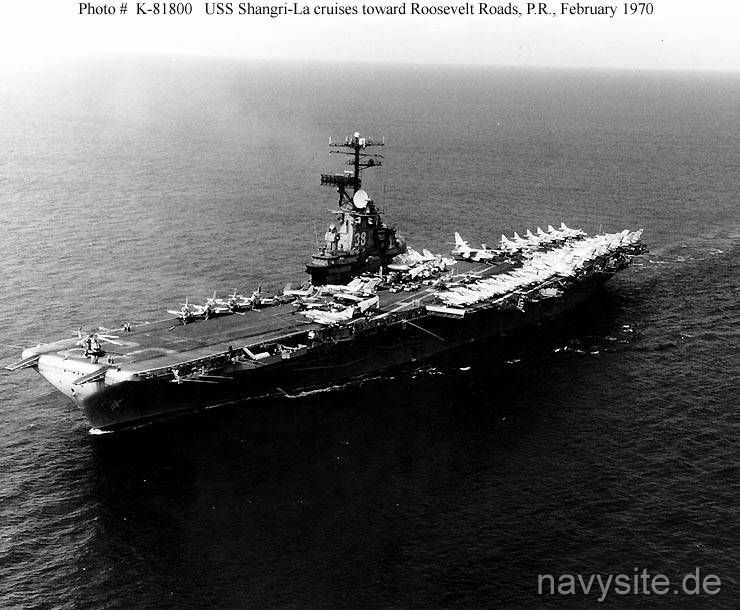 On 9 November 1970, SHANGRI-LA stood out of Subic Bay to return home. En route to Mayport, she visited Sydney, Australia; Wellington, N.Z. ; and Rio de Janeiro, Brazil. She arrived in Mayport on 16 December and began preparations for inactivation. After pre-inactivation overhaul at the Boston Naval Shipyard, South Annex, SHANGRI-LA decommissioned on 30 July 1971. She was placed in the Atlantic Reserve Fleet and berthed at Philadelphia. SHANGRI-LA remained in the reserve fleet for the next 11 years, and was stricken from the Navy List on 15 July 1982. On 9 August 1988, she was disposed of by the Marine Administration.